The Solution below shows the G minor triad chord in root position, 1st inversion and 2nd inversion on the piano, treble clef and bass clef. This step shows the G minor triad chord in root position on the piano, treble clef and bass clef. 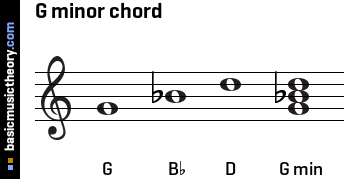 The G minor chord contains 3 notes: G, Bb, D.
The chord spelling / formula relative to the G major scale is: 1 b3 5. This step shows the G minor 1st inversion on the piano, treble clef and bass clef. 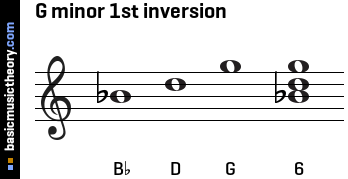 The G minor 1st inversion contains 3 notes: Bb, D, G.
This step shows the G minor 2nd inversion on the piano, treble clef and bass clef. 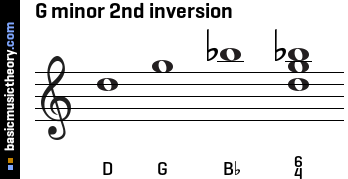 The G minor 2nd inversion contains 3 notes: D, G, Bb. 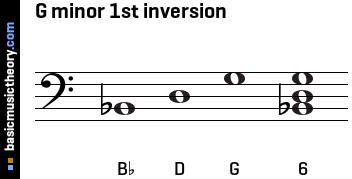 This step describes the G major scale, whose note intervals are used to define the chord in a later step. 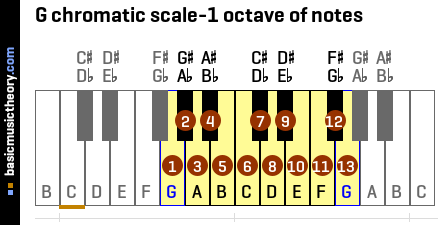 The steps below will detail the minor triad chord quality in the key of G.
This step defines the note intervals for each chord quality, including the intervals for the G minor triad chord. 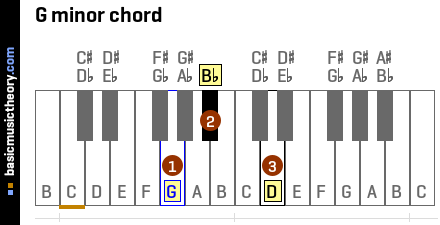 Looking at the table above, the note intervals for the chord quality we are interested in (minor triad), in the key of G are G-min-3rd and G-perf-5th. 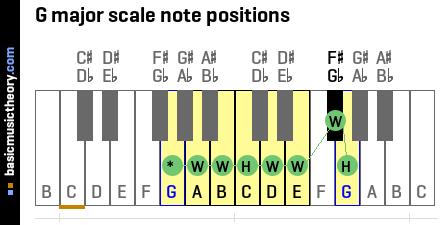 This step shows the G minor triad chord note interval names and note positions on a piano diagram. G-5th: Since the 5th note quality of the major scale is perfect, and the note interval quality needed is perfect also, no adjustment needs to be made. 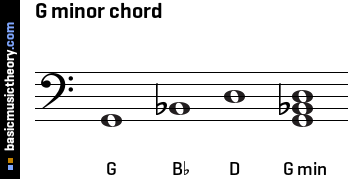 The 5th note name - D is used, and the chord note spelling is 5. In music theory, this triad chord as it stands is said to be in root position because the root of the chord - note G, is the note with the lowest pitch of all the triad notes. So another name for this chord would be G minor triad in five-three position. For example, the 5 represents note D, from the G-5th interval, since the triad root, G, is the lowest note of the chord (as it is not inverted). In the same way, the figured bass 3 symbol represents note D, from the G-3rd interval. 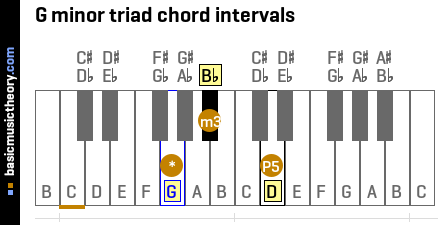 This step shows the first inversion of the G minor triad chord. 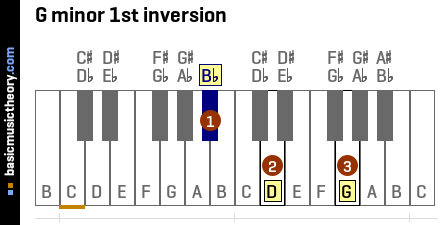 So for a 1st inversion, take the root of the triad chord in root position from the step above - note G, and move it up one octave (12 notes) so it is the last (highest) note in the chord. 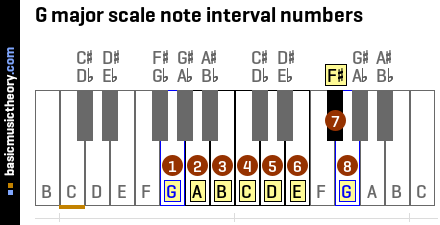 Based on this numbering scheme, another name for this inversion would be G minor triad in six-three position. 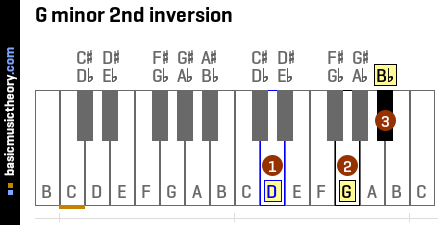 This step shows the second inversion of the G minor triad chord. 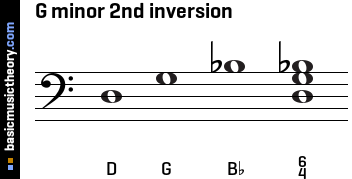 Based on this numbering scheme, another name for this inversion would be G minor triad in six-four position. In the same way, the figured bass 4 symbol represents note G, from the D-4th interval.